Magne-Feet are back in stock! With new Quality materials for even Better Results! Our Biomagnetic shoe inserts are designed to help improve blood circulation to your feet and lower legs by stimulating the many nerve endings on the soles of your feet. Magne-Feet are ideal for people who suffer poor circulation, cold feet, foot or leg cramp, varicose veins, and people who spend a long time on their feet. Ideal for nurses, golfers, bowlers, farmers, inside sneakers, work boots & gumboots. 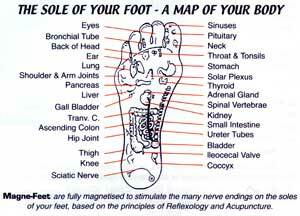 When you start wearing Magne-Feet you may notice a “tingling” sensation in your feet. This is normal and a positive sign the nerve endings are responding to the Magnetic Therapy. To Fit: One Size fits all. Simply peel the backing off the magnetic strip and place inside footwear, sticky side to the shoe upper. Or adhere the magnetic inserts to a pair of light insoles and move them to other footwear, as you wish. Totally natural, drug-free, all day, every day. Magne-Feet are designed to improve blood flow to your feet and lower legs by gently stimulating the many nerve endings on the soles of your feet. Ideal for sufferers from all kinds of foot and leg pain, poor circulation (cold feet) varicose vein, old injury, and people who spend a long time on their feet. Great for golfers, bowlers, farmers, factory and warehouse workers, shop assistants, etc. 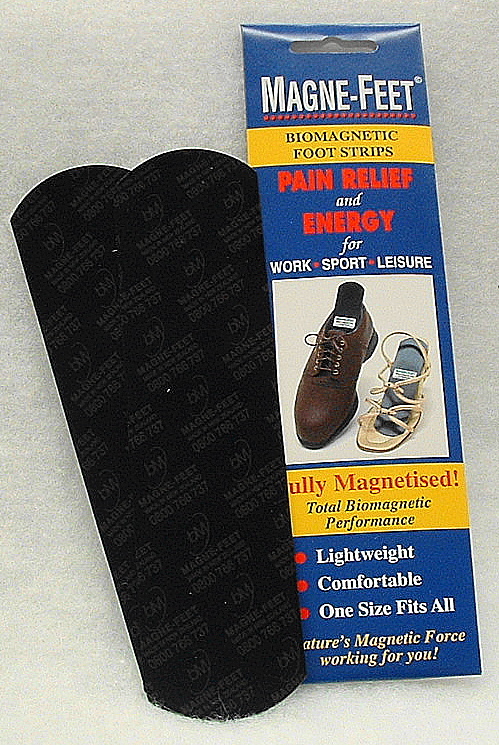 Magne-Feet magnetic foot strips harness Nature’s magnetic forces, way better than ordinary insoles! Simply peel backing off the magnetic insert and place inside footwear sticky side to the shoe upper. Or you can adhere the magnetic inserts to a pair of light insoles and move to other footwear as you wish. When you first start using Magne-Feet you may notice a “tingling” sensation, this is normal and a positive sign magnetic therapy is starting to work for you.